In Search Of Obama's Second-Term Agenda : It's All Politics The president has been relatively mum during the campaign about what he would do if given a second term. He outlined more specific ideas this week — but he hasn't explained how he would get those ideas through Congress. President Obama holds a copy of "The New Economic Patriotism: A Plan for Jobs & Middle-Class Security," which outlines some of his agenda for a second term, during a rally in Richmond, Va., on Thursday. What would President Obama do with a second term? It's been a bit of a mystery throughout the campaign. The president seems to devote at least as much time criticizing his Republican opponent Mitt Romney as he does explaining what he'd like to do if returned to office. Obama has taken some heat for his silence and sought to answer such complaints this week. But even as he's made his priorities more clear, he hasn't answered what may be the biggest outstanding question: how he'll get congressional Republicans to go along with his agenda. On Tuesday, Obama's campaign released a 20-page, photo-heavy booklet that it intends to mail to 3.5 million households in swing states. The overall themes in "The New Economic Patriotism: A Plan for Jobs & Middle-Class Security" have also been emphasized in ads and speeches this week. It's pretty simple. He wants to improve education, manufacturing and energy production; raise taxes on the wealthy to help reduce the deficit; and end the war in Afghanistan. In short, his second-term agenda sounds a lot like his first-term agenda. Whether that's a good thing or a bad thing depends on how you feel about his presidency at this point. Republicans, naturally, argue that a second Obama term would be a failure. A mantra of the Romney campaign has been that the country can't afford four more years like the past four. 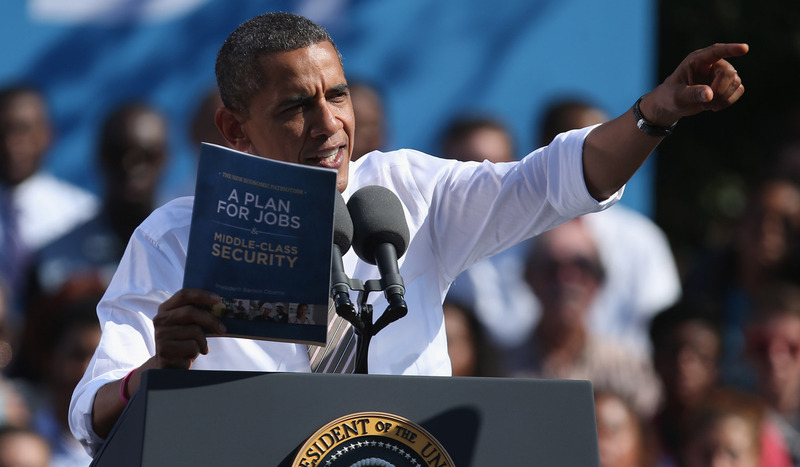 Kevin Madden, a senior adviser to the Romney campaign, dismissed Obama's new booklet as a "glossy panic button." Some Democrats say they'd be happy with a second term that builds on and consolidates the achievements of Obama's first term. Paul Glastris, editor in chief of The Washington Monthly, says the president would have to concentrate during a second term on finalizing matters such as banking regulation, as well as "getting Obamacare to work right." "This guy did so much in his first term that still needs to be regulated out and adjudicated," says Glastris, a former senior speechwriter for President Bill Clinton. "If all he does in the next four years is dealing with what he did in the first four, that will be a hell of a good eight years." The importance of the Affordable Care Act is indeed highlighted in Obama's booklet, as are what might be described as defensive positions on entitlements, with promises to defend Social Security and Medicare against Republican initiatives such as privatization and vouchers. In an interview with The Des Moines Register that was originally conducted off the record, Obama suggested congressional Republicans will be forced to compromise with him because of the so-called fiscal cliff — a combination of automatic spending cuts and expiring tax cuts that could harm the economy if Washington fails to act before the end of the year. "The real obstacle will be the House, and there he'll have to be exceedingly aggressive," says Thomas Mann, a congressional scholar at the Brookings Institution who has written critically of contemporary Republicans. He believes the perils of the fiscal cliff give Obama a "reasonable chance" of extracting a deal from congressional Republicans, who aren't in favor of raising taxes on top earners, as Obama favors. "They won't drop their objections," Mann says. "The question is whether circumstances will lead them to find a different baseline." The president has been hopeful that the fact of his re-election would make congressional Republicans more amenable to compromise on budget and tax issues, but his recent restatement of principles in those areas has done nothing, as yet, to bring them around. Much depends, obviously, on how the election plays out. "I expect you'll have to see all sorts of compromises from both sides of the aisle," says presidential historian Robert Dallek. "But it depends on what Obama might win by. If he loses the popular vote and squeaks through with the electoral vote, that makes things more uncertain." One issue that isn't mentioned in Obama's booklet but could get considerable attention during a second term is immigration. "It's been pretty clear to us that he's going to make immigration reform a priority in his second term," says Frank Sharry, executive director of America's Voice, which takes a liberal position on immigration. Sharry says Obama will owe his victory in no small measure to Hispanic voters, who will want to see action on immigration issues. The question, he says, is whether Republicans will view Obama's victory — which would likely be based on demographic trends that could handicap the GOP in the future — as a prod to greater cooperation. The president himself expressed optimism on this score in the Des Moines Register interview. "Should I win a second term," Obama said, "a big reason I will win a second term is because the Republican nominee and the Republican Party have so alienated the fastest-growing demographic group in the country, the Latino community."